BEST SELLERS: Suzanne Collins is the author of the bestselling Underland Chronicles, which started with George the Overlander. In the Hunger Games, she continues to explore the effects of war and violence on those coming of age. Other books in this series are Catching Fire and Mockingjay. Sixteen year old Katniss Everdeen, who lives alone with her mother and younger sister, regards it as a death sentence when she steps forward to take her sister's place in the Games. But Katniss has been close to dead before- and survival, for her, is second nature. Without really meaning to, she becomes a contender. But if she is to win, she will have to weigh survival against humanity, and life against love. Suzanne Collins delivers equal parts suspense and philosophy, adventure and romance, in this searing novel set in the future with unsettling parallels to our present. They do surgery in the Capitol to make them appear younger and thinner. In District 12, looking old is something of an achievement since so many people die early. You see an elderly person you want to congratulate them on their longevity, ask the secret of survival. A plump person is envied because they aren't scrapping by like the majority of us. This is a book you'll find your nose buried in until you finish it. I just could not put it down; I was practically walking around reading it and consequently banging into things. The plot is, of course, outstanding. The book might not bring you to tears, but it will shake you to the core. That I actually enjoyed reading the book kind of disturbs me somewhat, to be quite honest; considering the fact that the whole time I'd been cursing people for being so sadistically entertained by gory reality shows. Because, that's what this book subtly draws you attention to- the awful truth about the public, and the government. 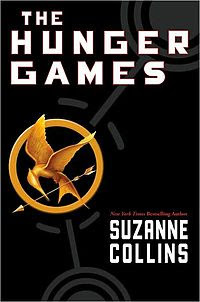 To punish the downtrodden for rebelling against the Capitol, and to remind them never to challenge their superiority, they introduced the disgracefully popular Hunger Games, which have 24 young boys and girls fighting each other, trapped in an outdoor arena that could be anything from a frozen wasteland to a burning desert. The catch? Only one would survive. While the training sessions and makeovers are amusing, the gruesome deaths are all the more haunting because these are children we are talking about. Here's science fiction blended with philosophy; just the right touch of romance and a dash of humor. There are such a lot of unexpected surprises, right until the end of the story- it's fulfilling and there's still something to look forward to; like having a sumptuous meal and waiting for desert. Eager to read the next book in the series. I read the book pretty recently, and I am in love! I love the way Peeta declares his love for her, the singing and everything. It is gruesome yes, it makes me wonder, what if this is our future? Anywayy :P, loved the book and really enjoyed reading your review. I would love to review the 2nd book in the series if you haven't already started? @blahblaholic: of course, you can review it! :) i loved all of those things too, although i have to admit i liked gale better in the book AND the movie...well, u can't blame me for loving him in the movie. :P but yeah, by the time i came to the third book, i was all for peeta. he is a great, exceptional guy. the thought that this really could be our future is what's most scary. i seriously hope this is not how we'll all end up.